Located just below Canyons Resort at Park City’s Waldorf Astoria (2100 Frostwood Drive, Park City, 435-647-5500, ParkCityWaldorfAstoria.com) and adjacent to Powder restaurant, the Powder Ice Lounge has opened for the 2014 winter season. 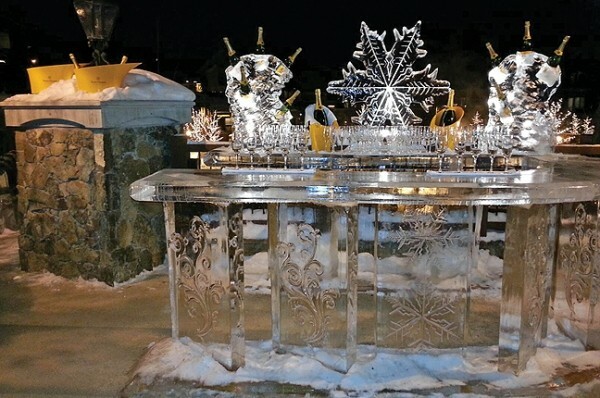 This is a very cool (literally) concept: a 14-foot bar constructed entirely of carved ice and outfitted with sculpted-ice furniture. Powder Ice Lounge features flutes of Moet & Chandon Imperial and Veuve Clicquot Yellow Label Champagne, as well as specialty cocktails like the Ben Lomond, Lone Peak, Timpanagos and the maple-spiced Manhattan, made with High West Rendezvous Whiskey, sweet Vermouth, maple syrup, cinnamon, allspice and cloves. Guests can also create custom Champagne drinks by adding mixers and garnishes like olives, strawberries, raspberries and so on. There’s also nightly live entertainment, passed hors d’oeuvres and cozy fur blankets to keep guests warm. Pulp, an independent smoothie and juice bar, has opened at 51 S. Main in Salt Lake City (801-389-9442, Facebook.com/PulpSLC), inside The Gym at City Creek Center. Pulp features drinks made with real fruits and veggies and no added sugars, fresh juices, supplements and “workout shots,” sandwiches and homemade soups, such as vegan Moroccan coconut-lentil. Sounds like the perfect place to help you keep your healthy New Year’s resolutions. I’m not particularly proud of it, but I have an inexplicable addiction to Popeyes Louisiana Kitchen’s spicy fried chicken, shrimp po’boys, side dishes—like red beans & rice—and, especially, their Cajun rice. A slew of my friends and colleagues have the same jones for Popeyes. Unfortunately, with the exception of the Thanksgiving Point store, the only Utah Popeyes locations are secured ones: at Hill Air Force Base and in Concourse B of the Salt Lake City International Airport. Well, I have good news for Popeyes lovers. If you happen to be in the vicinity of the airport, Popeyes offers free curbside delivery! Simply call Popeyes directly at 801-322-6317, place your order and it’ll be delivered right to your car.